Watson was born on this day in 1928. An American geneticist and biophysicist, he shared the 1962 Nobel Prize for Physiology or Medicine (with Francis Crick and Maurice Wilkins) for the discovery of "the molecular structure of nucleic acids and its significance for information transfer in living material." Deoxyribonucleic acid (DNA) is the substance contained in cells that controls heredity. 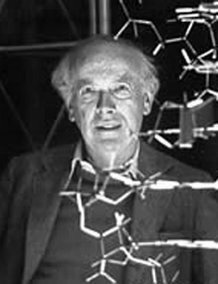 Crick and Watson began their collaboration in 1951, and published their paper on the double helix structure on 2 Apr 1953 in Nature. This accomplishment became a cornerstone of genetics and was widely regarded as one of the most important discoveries of 20th-century biology.